The HH-60J Jayhawk is a medium-range recovery helicopter built by Sikorsky Aircraft Corporation. It is used to perform search and rescue, law enforcement, military readiness, and marine environmental protection missions. Implementation of the HH-60J began in March of 1990 with the delivery of the first airframe to NAS Pawtuxet River, Maryland for developmental testing. ATC Mobile, Alabama was the first Coast Guard unit to fly the aircraft as instructor pilots prepared for pilot training in March 1991. Coast Guard Air Station Elizabeth City was the first operational unit with the Jayhawk. 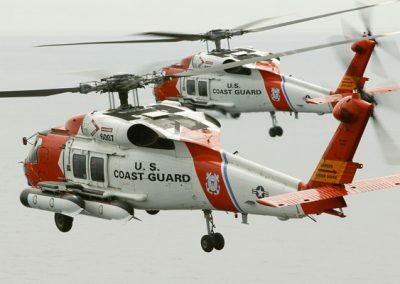 The United States Coast Guard purchased 42 HH-60Js. 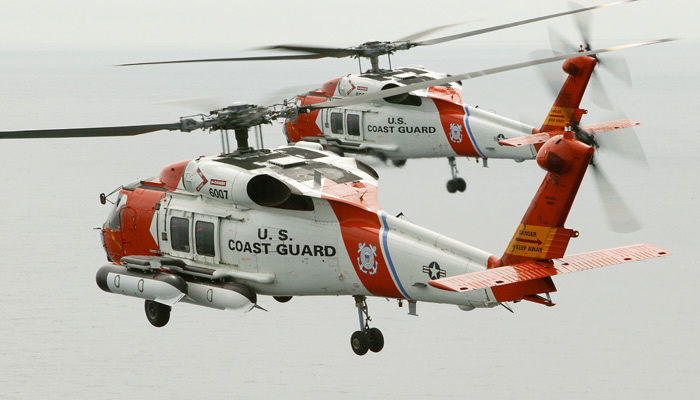 They replaced the Sikorsky HH-3F Pelican helicopters that the Coast Guard had used for over 20 years. The HH-60J is similar to the HH-3F in many ways, and the assigned missions are the same. 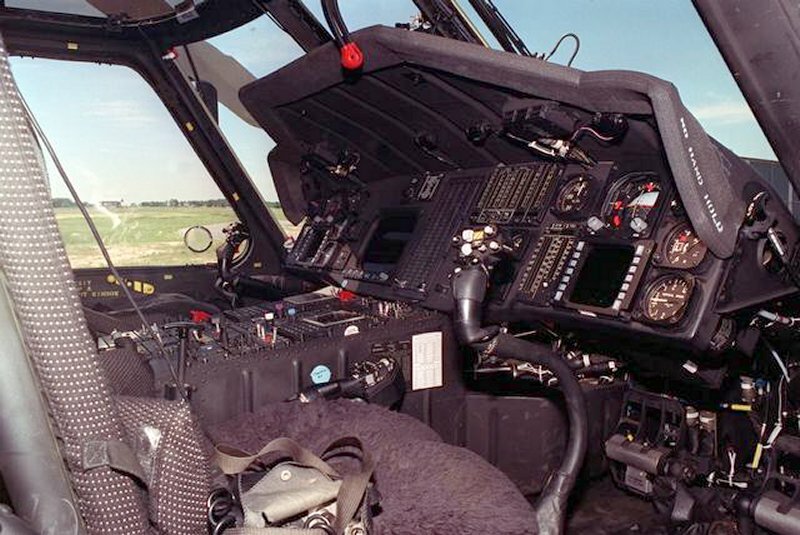 However, the HH-60J has numerous upgrades including a state of the art electronics package. The HH-60J is lighter, faster and the engines have more power. The HH-60J requires considerably less maintenance than the HH-3F. The de-icing system on the aircraft’s rotor blades is a plus. The Jayhawk’s drawback is the lack of space due to a cabin that is one-third the size of the HH-3F. Additionally, it does not have the water landing capability that the HH-3F had. The twin T700-GE-401C engines, each rated at 1,662 shaft horsepower, give the aircraft a maximum takeoff weight of 21,884 pounds and enables a cargo sling load of 6,000 pounds. The Jayhawk can fly 300 miles offshore, remain on scene 45 minutes, hoist six people on board, and return to its point of origin with a safe fuel reserve. Normal cruising speeds of 135-140 knots can be increased to a “dash” speed of 180 knots when necessary. It will fly comfortably at 140 knots for 6-7 hours. State-of-the-art radar, radio, and navigation equipment enables the helicopter to carry out the Coast Guard’s search and rescue, law enforcement, military readiness, and marine environmental protection missions efficiently and effectively. The Jayhawk uses the NAVSTAR Global Positioning System as its primary long range navigational aid. The Collins RCVR-3A radio simultaneously receives information from four of the system’s 18 worldwide satellites and converts it into fixes, pinpointing the helicopter’s position. 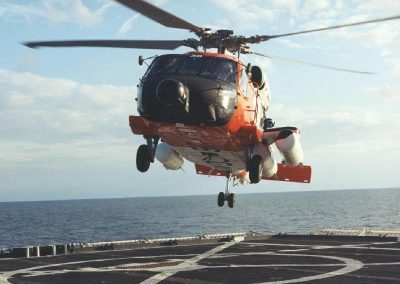 Though normally stationed ashore, the Jayhawk can be carried aboard 270-foot WMEC and 378-foot WHEC Coast Guard Cutters. These cutters are capable of refueling and supporting the helicopter for the duration of a cutter patrol. They assist in the missions of search and rescue, enforcement of laws and treaties including drug interdiction, marine environmental protection, and military readiness. 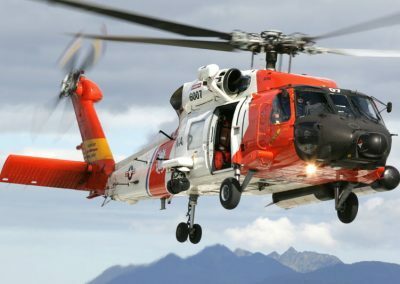 The USCG began converting its HH-60Js to MH-60Ts in January 2007. This avionics and capabilities upgrade was part of the USCG’s Integrated Deepwater System Program and provided a glass cockpit, an enhanced electro-optic/infrared sensor system as well as a radar sensor system and airborne use of force capability. The airborne use of force package includes both weapons for firing warning and disabling shots and armor to protect the aircrew from small arms fire. The MH-60T upgrades began in April 2009 and all 42 aircraft were upgraded by July 2013. Four H-60 units Maintain Airborne Use of Force (AUF) and all of the MH-60s are AUF equipped.